Well that was fast….it’s Live! And yes there’s snow in Springfield! Currently Live on Android (looks like Android users got their wish) AND iOS AND Kindle. You may have to do a Tapped Out Search in the Store (and then tap on it for more info), to see the update. I did. It’s also a MASSIVE update…remember every item in the game has to be reloaded to show it covered in show. So make sure you’re on WiFi and have some time…it goes up to 1227.2MB on my Android. It’s HUGE. First the disclaimer…I know this isn’t the Christmas Update many of us anticipated this year. It’s a little “off” for what we typically get this time of the year. And I know some of you have commented that this update would have been better suited for a THOH Update. I get it. Believe me I get it. So I would say to those of you upset about this update. Give it a chance. From what I can see in the files there are some funny twists and turns..and a few battles for Christianity to win out in this one. So give it a chance, it’s only day one. You never know you might really want a prize coming later one. And the bright side? This is probably one of the shortest Winter Events (let’s face it this isn’t Christmas, although they call it XMAS 2016 in the files) we’ve ever seen. With only 2 Acts and it’s set to end before New Years (Spoiler there’s potentially some New Year items waiting as well…). So give it a chance, laugh at the dialogue (including Homer’s Bacon Fest…I know most of us can get on-board with that..mmm bacon) and remember this is a game. It’s a game about a show that picks on everyone and everything. So let’s see what the next 4 weeks bring…and then it’s onto the next thing! Also it’s important to note that A LOT of this update is based on Sunday’s episode of The Simpsons. That’s where a lot of the premise for this update came from..so it’s not just EA. It does tie in with what the Simpsons will be doing on Sunday. Now that I’ve gotten that out of the way…onto the finer details. Springfield Henge- Free, 11×11 in size. Building this is what will get the event to trigger in your game. A little later in the questline you’ll unlock the Lumber Mill, another free Building..
Lumber Mill- Free, 8×8 in size. 4hr Build This controls crafting. Patches and Poor Violet- 100 Donuts. Like Sherri and Terri, two characters but act as one. 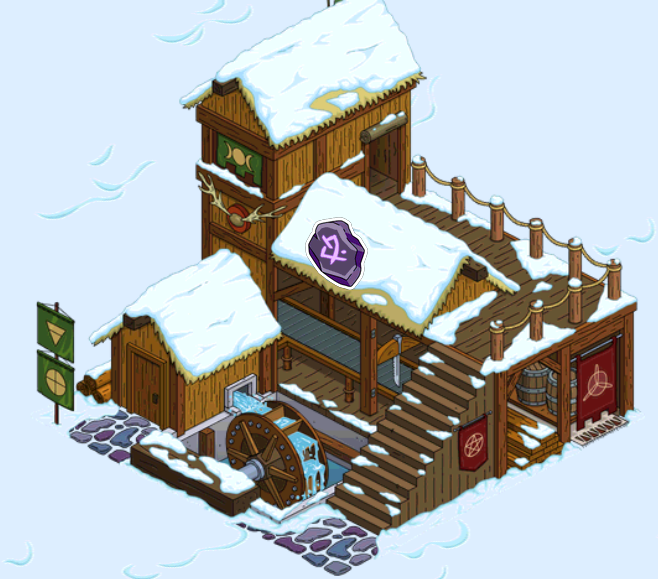 Also help with the winter event (earn currency). As some of you have noted this event is only two Acts. That’s it! Act 1 ends December 18th and Act 2 ends December 30th. So for those of you hoping they’d finish the event out BEFORE the New Year, you’ve got your wish. This is a short one! Runestones- Crafting Currency. 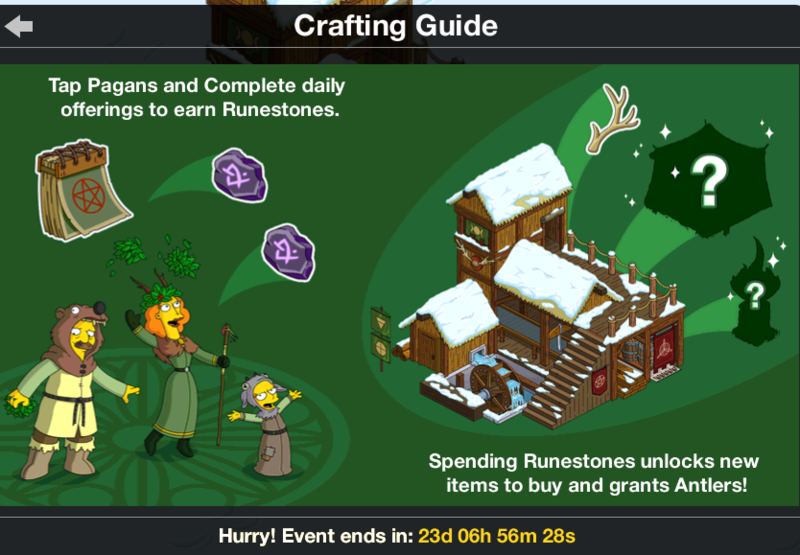 Collect Runestones to Craft the available prizes. Catnip- Currency you earn by sending characters on tasks. Turn in Catnip at Springhenge to earn more Antlers/Runestones and other prizes. Figurines- Just like Catnip, Figurines are a currency you earn by sending characters on tasks. Turn in Figurines at Springhenge to earn more Antlers/Runestones and other prizes. Goblet of Runestones- 42, 300 . 250 Runestones, used for Crafting. 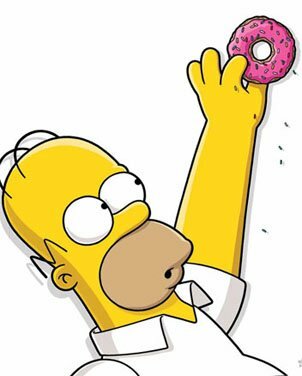 And yes for those wondering there IS a Bonus way to earn donuts after you’ve unlocked all of the prizes. For every 5,100 you collect after The Parson you’ll have your chance at 1, 2 or 3 donuts. Crafting takes place at the Lumber Mill. You’ll unlock the Mill for FREE once you’ve completed Logging In. Once again you’ll have to level up to unlock more crafting prizes. And the items will be around for the entire event (all 23+ days of it). This time there’s only 10 Levels. Small Pagan Tent- 210 . Awards 229 on placement. 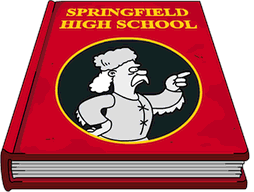 For Act 1 you’ll see Pagans pop up in Springfield. Tap them to earn Antlers AND Runestones. 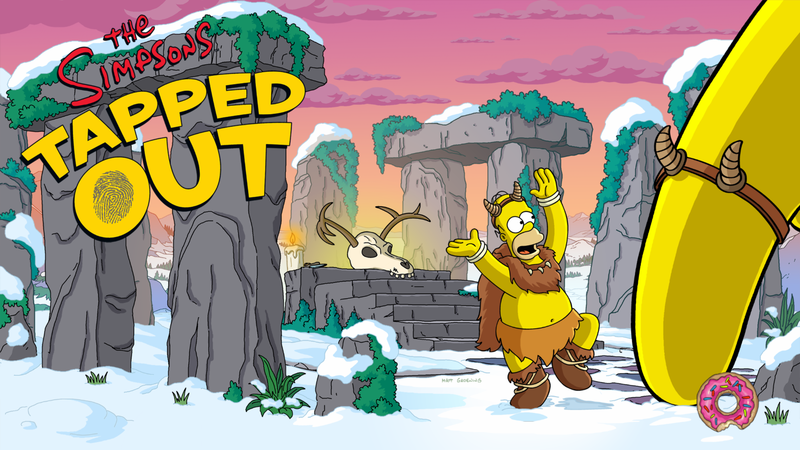 For every Pagan you tap in YOUR Springfield you’ll earn 10 and 2 . You’re collecting all that Catnip and Figurines to hand in at Springhenge. Handing in these items will earn you more Antlers, to unlock more prizes. Also, each day there will be a set number to hand in for that day, handing in that number will unlock a bonus prize for you. So for Day 1 (day) complete 4 hand ins to unlock the Day 1 Bonus..more Runestones, for crafting. As you can see when you have enough to hand in you’ll see a checkmark next to that list. This is very much like the Monorail Event and Blueprint, etc, hand ins. 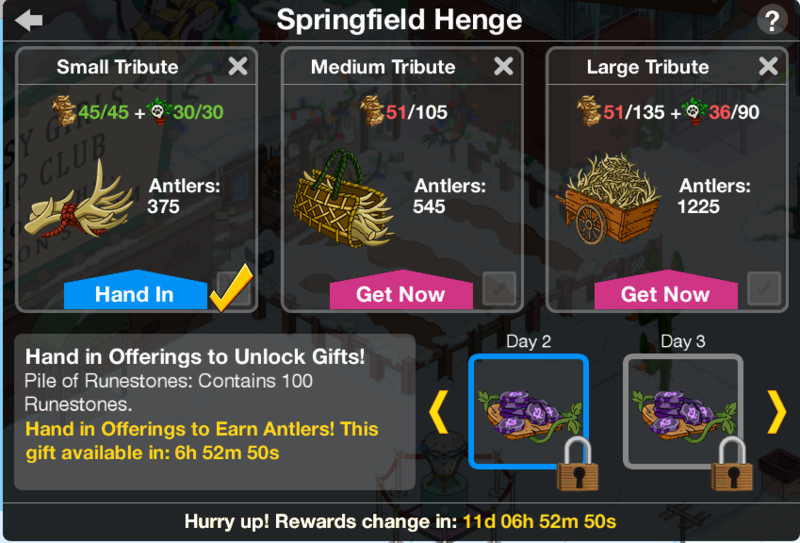 Once you’ve completed your hand ins for that days bonus, you’ll still be able to hand in items to collect more Antlers to unlock prizes…. 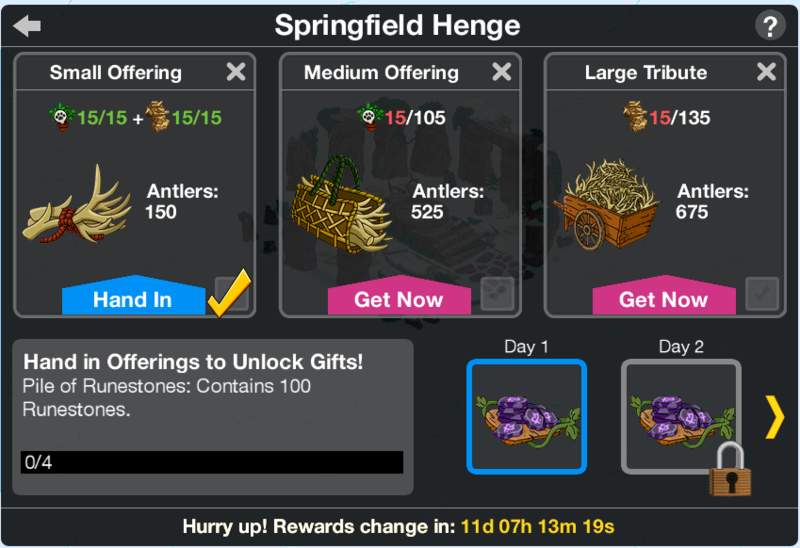 BUT…just like the Monorail Event, there is a cap on the number of Antlers you can earn per day from Springhenge. 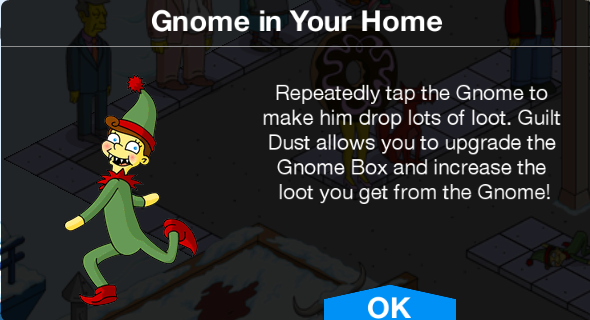 Tapping on the Gnome during the mini game (which I’ll breakdown in it’s own post), will earn you more currency. And upgrading the box will earn even more currency. Just follow the direction of the Gnome Compass in the top right corner and it will lead you to the Gnome. 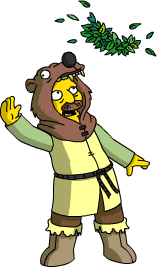 You’ll have 20 seconds (i think that’s what it said) to clear him from Springfield and earn bonus currency! 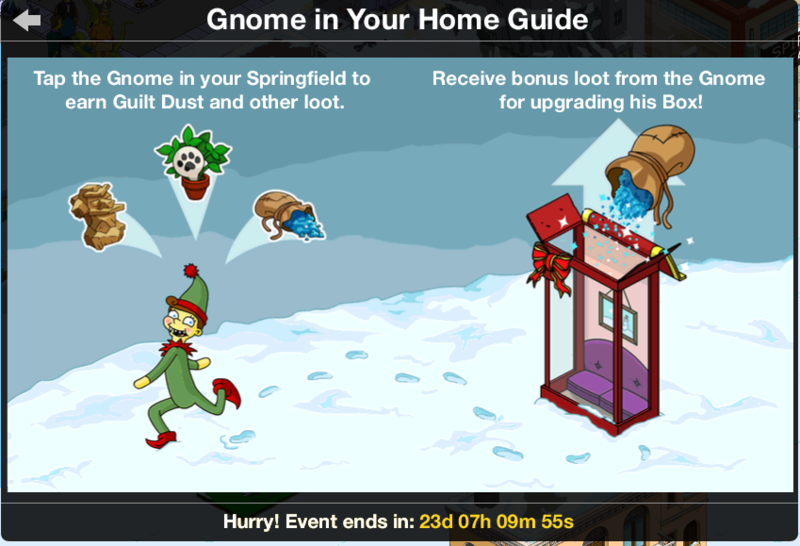 Once you’ve unlocked the Gnome in Your Home in your Springfield you’ll be able to find him in a neighbors town. This will allow you to earn bonus currency! However, you can only find him ONCE PER DAY via a neighbor’s town. In addition to the Gnome in one neighbor’s town, you’ll be able to tap three Pagans in a neighbor’s town. 90 actions/day. Each Pagan you tap in a neighbor’s town will earn you 5 and 2 . Neighbor actions, to tap Pagans, unlock during Pagan Paradise Pt. 2. And that’s it my friends! 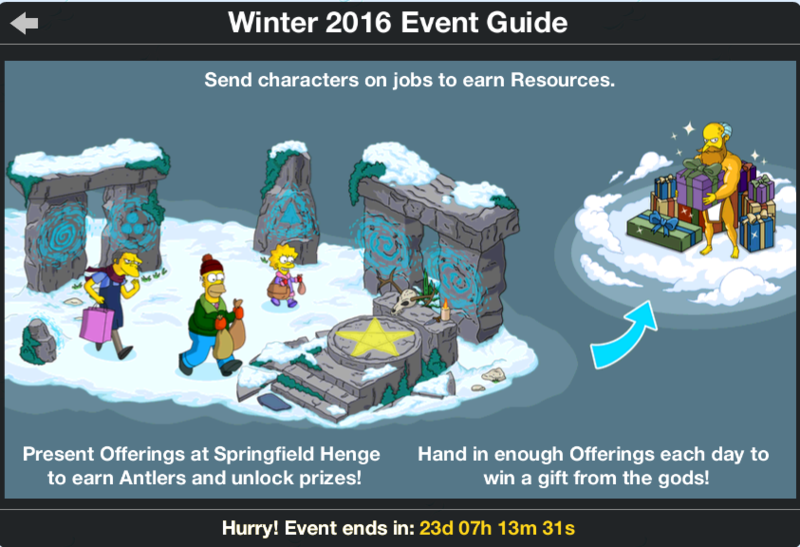 The quick rundown…or not so quick, this post too a while to complete…of the 2016 Winter Event! This is a fairly simple one. Something short and easy. Keeps us entertained, but allows us all to spend time with our families and friends over the holiday season. 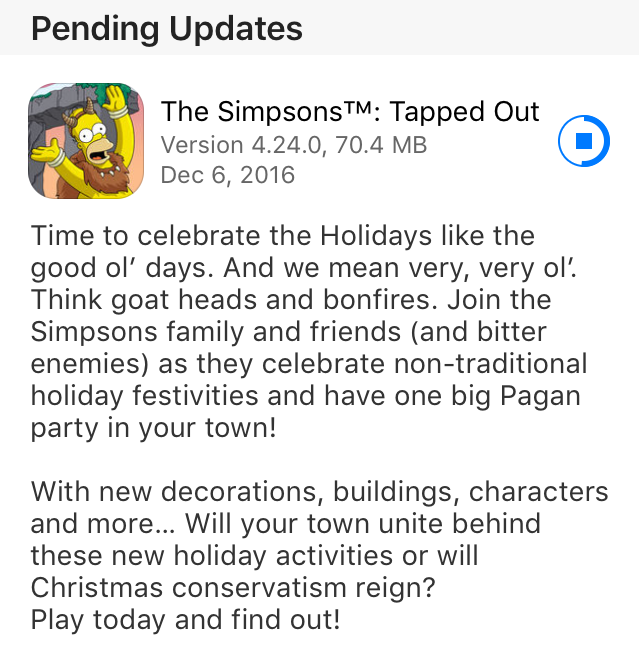 This entry was posted in Game News, Updates and tagged Tapped Out Christmas Event, Tapped Out Tips and Tricks, The Simpsons Tapped Out, TSTO 2016 Christmas Event, TSTO Addicts, TSTO Christmas, TSTO Pagan Event, TSTO Tips and Tricks, TSTO Winter Event 2016. Bookmark the permalink. Hi, I crossed the threshold of antlers to earn the Parson while in a neighbor’s town (while tapping pegans) & now he is not in my town! It shows I earned him, but he is no where to be found. Very frustrating. Any ideas or suggestions? He was in my inventory! All the way to the right. In the daily bonus part, where you hand in 4 lots in exchange for antlers, I’ve got as far as day 12 and received the runestones reward- however, there’s a final day 13 reward (it’s gold coloured) but my timer says “new prizes in 21 hours”. Does this mean that I’ll miss out on the day 13 prize because it’ll disappear before I can unlock it? I have same thing. Day 13 prize. It isn’t crafting, it is the exchange. Is it a special prize, or is it runes, etc. I think I may have missed the first day. Thanks!! 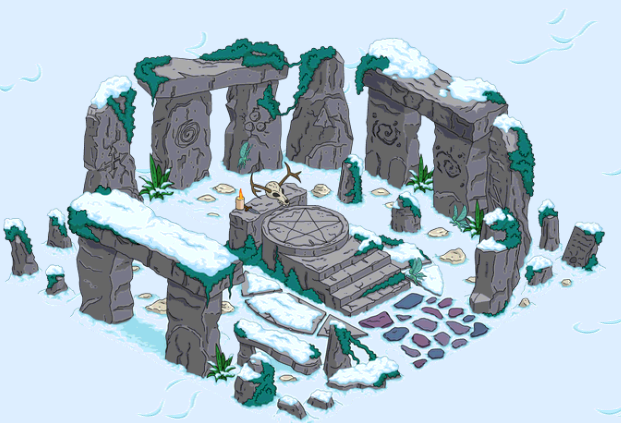 Why is it that turning in catnip and carvings at Springfield henge is so heavy on spending carvings? I currently have over 1400 catnip but I can’t make carvings fast enough to be able to get antlers! Still no gnomes … ? How do I get to finish my box upgrades. Or have I maxed out my leveling up until act 2 ??? Uuuggghhhh. Help. Confirm Donut got knocked off. Woke up 2:00am, 5 minutes ’till,time for my Gnome and renew catnip and carvings, perusing the store for NEW items and just bought LING. 110 donuts spent that I didn’t want to. Life could be worse, could’a bought one of those Express Tickets that’s good only for the Event. Already got the Parson, so,I’m just biding time. Still have a little Quick Thoughts $$$$, can always spend that and ‘real’ money if my remaining 285 donuts falls short. Check your confirm donut spend.!! Or don’t play ar 2:19am. When I tap pagans in my neighbors’ towns, I’m topping out at probably around 30 actions where I get 5 antlers and 2 runestones. Anything I do after that I get 1 antler, 0 runestones. Is this happening for anyone else? I found that the first 10 neighbours I get 5 antlers and the 2 runestones then the next 5 neighbours I get 1 antler and 0 runestones just like you. after that i just get cash and experience. So I found that there is no point going though all of my friends to get event currency. I will do my first 15 then the next day I will do the second set of 15 and so on. 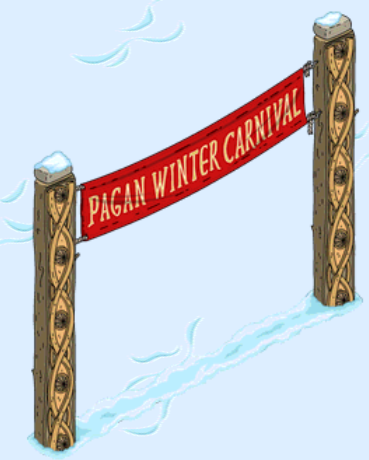 Rather lame in my opinion to have to spend so much time searching for pagans in neighbours to get so little in return. Really, they should just lower the amount earned and allow you to get tehm from all ones friends, BUT, as there is always a BUT. People with few friends would lose out. So, I guess the way they are doing it equalizes the currency collection. That’s not what it says in the rundown. Each Pagan you tap in a neighbor’s town will earn you 5 antlers and 2 runestones. For me, that payout ends after 10 neighbors / 30 actions. Ah, I see. My mistake. 10 neighbors does seem too few…. Since the event started there have been a ton of comments from folks who pretty much all are getting currency from around 17 (or 15-17) towns. It’s definitely not 90 taps, though….that was most likely just a copy and paste error from a previous event post. My new god burns isn’t showing up (possibly because I was in a neighbour’s town when I reached the prize) and I haven’t gotten any related quests either. Is this a glitch? Check your inventory, your whole inventory not just the character section, see if he’s there. If not, contact EA. My New God Burns isn’t showing up in his menu or my storage. Any ideas? Anyone know why tapping the singing stones doesn’t work? I thought I see something in amother past but I can’t find it. Also, do we get a gnome box as a decoration? My gnome finder is gone!! And I can’t find the damn thing anywhere?!?!?! Help! 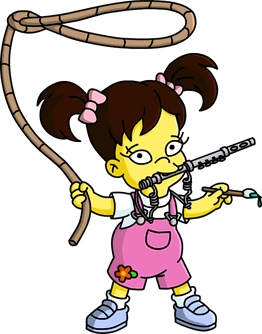 Go to Krustyland and return to Springfield. This will reset the gnome radar. Try going to krystyland, and and back it worked for me. Thank you SO MUCH for this!!! Going to Krustyland did indeed work. So grateful to you all!! So where do I send my issues? I’ve been trying to figure out the runestones and here I read about a lumbermill that I never got and pagans that have yet to show up. I have a Stonehenge and have been working towards antlers and I kept wondering about why they’re giving me runestones that I can’t do anything with. I have logged out and back in, visited krustyland, and rebooted my devices and still no lumbermill or pagans what’s the issue? The game didn’t even say there was an update this time I had to go to the play store to find it and discover it started the day before. You are simply describing how this update works. As with all of large event updates, they have to be downloaded from the App Store for your device. After that…follow this guide as to what happens when…and next. You have to follow a sequence of tasks, in order, to get to the next stage. After that…you are on your own, as there is no “Central Help” guide for the update. I was stuck too the first day or so. I e no pagans. Completed a quest icon and the game moved forward. before the update christmas skins for buildings were available. now i cant find them. are they still there somewhere? They are as Elvis. They have left the building. 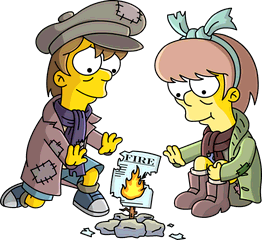 Regarding Springfield Henge: Should I turn in Small offerings to get four a day or, just like with the monorail, only hand-in Large tributes? Thanks in advance for a reply! Thank you kindly! I thought I read all the xmass threads but apparently not.. I turn in 4 small offerings to get my four in for the day then I go for the big offerings! I guess I will just follow your lead! What I do is to hand in four small packages 📦 to get the dally price and then the large packages. Thanks, from now on so will I! I turn in smalls to get prize, then only large because it has the best return. But, you could probably only turn in large and if you get behind, go with the smalls. I’m really loving those singing stones. Singing Stones? Anyone got the correct order? I need some help it says the gnome is loose but I go to his box and he is still in it and the compass isn’t showing up, what should I do? Go to Krustyland and back. Should fix it. Hello fello addicts! It’s nice seeing the game get these interesting updates. I know I am enjoying it. 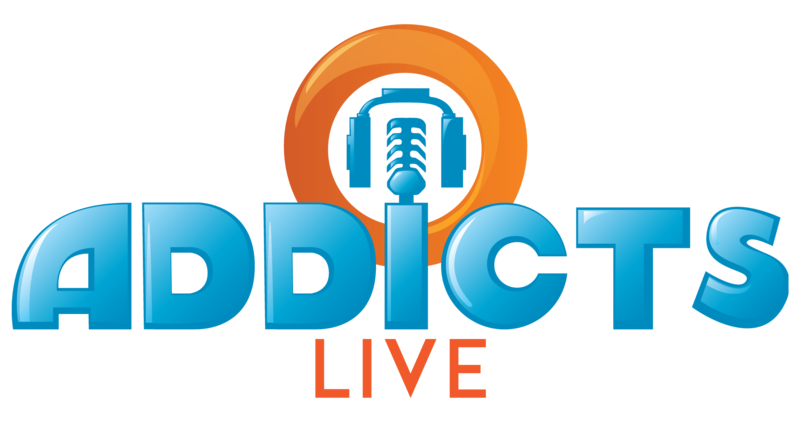 Thanks for the awesome posts addicts!